During WWII and the decades after it, Jewish life fell into decay and by 1990, there were only 200 Jews left in Berlin. Then the foundation of the New Berlin Synagogue - Centrum Judaicum was made, and the Adass Jisroel community established itself and built another synagogue at Rykestraße, alongside a kosher butcher shop, a cafe and a magazine press. The Jews slowly returned to Berlin. The District of Spandau is one of the most important centers of Jewish life in Berlin today, with restaurants and cafes, the Anne Frank Center, a Jewish gallery and the Beth Cafe, run by the Adass Jisroel. The golden dome of the New Synagogue is a dominating structure on the skyline here. It was originally built in 1866, and heavily damaged in 1943. It was the largest synagogue in Germany and it crumbled in 1958 due to lack of maintenance. Then in 1988, a partial reconstruction started, and it culminated in 1995, when the Centrum Judaicum, museum and venue was thrown open to worshippers. On the Große Hamburger Straße sits a memorial stone that commemorates the murdered Jews of Berlin. It is a memorial stone for Moses Mendelssohn, and reminds visitors of the old cemetery that dated from the 17th century and that was brutally devastated by the Gestapo. Near it, a Jewish boarding school stands; it was set up in 1993. The 42-hectare Jewish Community Cemetery, the Weißensee Cemetery, has over 11500 graves, and has maintained the Register of Deaths intact. Close to the Brandenburg Gate in the former Ministergaerten is the Holocaust Memorial. The Memorial of the Murdered Jews of Europe has 2711 concrete slabs or "stelea" with names of some of the Jews murdered in the Holocaust. In a subterranean "Place of Information", at the "Room of Names", names and biographies of the Jewish victims of holocaust are read out ceaselessly. 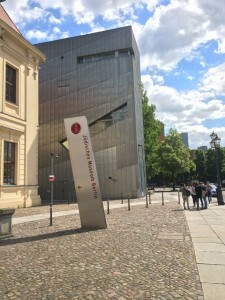 The Berlin Jewish Museum is one of the largest Jewish museums in Europe, spread across three buildings. Housed in it is two millennia of German-Jewish history; the three axes of the museum symbolise three paths of Jewish life in Germany - their continuity in Germany, their emigration from Germany and the Holocaust. Also notable here are the different special exhibitions, the Shalekhet installation and the Rafael Roth Learning Center, in addition to the archives and the Leo Baeck Institute Archive. With over 720,000 visitors annually, the Jewish Museum at Berlin in one of the most visited museums in the city. In Wannsee, the Max Liebermann Villa has a documentary exhibition on the ground floor with special emphasis on the Liebermann family. The top floor has garden paintings, pastels and graphics by Liebermann. The Rykestraße Synagogue is Germany's largest, and was only spared destruction because the Nazis did not want to affect the surrounding houses. It served as a prayer room for Jews from 1953 onwards, but has been restored to full glory post its renovation. Today, the interior, with its Neo-Romanesque architecture and large stained glass windows can accommodate 2000 people attending prayers and concerts where Jewish artists perform. Alongside these sites, there is also the Literaturhandlung, a Jewish bookstore with an impressive store of Jewish literature, CDs and audio books, as well as antiquities and ritual items. The Bimah at at No. http://www.giltravel.com/blog/jewish-heritage-and-history-of-berlin/22 Jonasstraße in Berlin-Neukölln organizes theatre performances for anyone interested in learning the Jewish history and culture. Find out how the Maccabi games connects you to your Jewish heritage. Click the button below to watch cheer for your team at the Maccabi Games in Berlin.